There's little mention in the mainstream media these days, of traditional foods having healing properties. Sure, there's a ton of hype touting unfermented soy products, vegetable oils and supplements as modern saviors, but in reality, these items have risk-to-benefit ratios like many drugs do (1). Few people are aware that clean, raw milk from grass-fed cows was actually used as a medicine in the early part of the last century (2)(3). That's right. Milk straight from the udder, a sort of "stem cell" of foods, was used as medicine to treat, and frequently cure some serious chronic diseases (4). From the time of Hippocrates to until just after World War II, this "white blood" nourished and healed uncounted millions. Clean raw milk from pastured cows is a complete and properly balanced food. You could live on it exclusively if you had to. Indeed, published accounts exist of people who have done just that (5)(6). What's in it that makes it so great? Let's look at the ingredients to see what makes it such a powerful food (7). Our bodies use amino acids as building blocks for protein. Depending on who you ask, we need 20-22 of them for this task. Eight of them are considered essential, in that we have to get them from our food. The remaining 12-14 we can make from the first eight via complex metabolic pathways in our cells. Raw cow's milk has all 8 essential amino acids in varying amounts, depending on stage of lactation (8). About 80% of the proteins in milk are caseins- reasonably heat stable and, for most, easy to digest. The remaining 20% or so are classed as whey proteins, many of which have important physiological effects (bioactivity) (9). Also easy to digest, but very heat-sensitive (10), these include key enzymes (11) (specialized proteins) and enzyme inhibitors, immunoglobulins (antibodies) (12), metal-binding proteins, vitamin binding proteins and several growth factors. Current research is now focusing on fragments of protein (peptide segments) hidden in casein molecules that exhibit anti-microbial activity (13). Lactoferrin (14), an iron-binding protein, has numerous beneficial properties including (as you might guess) improved absorption and assimilation of iron, anti-cancer properties and anti-microbial action against several species of bacteria responsible for dental cavities (15). Recent studies also reveal that it has powerful antiviral properties as well (16). Two other players in raw milk's antibiotic protein/enzyme arsenal are lysozyme and lactoperoxidase (17). Lysozyme can actually break apart cell walls of certain undesirable bacteria, while lactoperoxidase teams up with other substances to help knock out unwanted microbes too. The immunoglobulins, an extremely complex class of milk proteins also known as antibodies, provide resistance to many viruses, bacteria and bacterial toxins and may help reduce the severity of asthma symptoms (18). Studies have shown significant loss of these important disease fighters when milk is heated to normal processing temperatures (19). Lactose, or milk sugar, is the primary carbohydrate in cow's milk. Made from one molecule each of the simple sugars glucose and galactose, it's known as a disaccharide. People with lactose intolerance for one reason or another (age, genetics, etc. ), no longer make the enzyme lactase and so can't digest milk sugar (20). This leads to some unsavory symptoms, which, needless to say, the victims find rather unpleasant at best. Raw milk, with its lactose-digesting Lactobacilli bacteria intact, may allow people who traditionally have avoided milk to give it another try. The end-result of lactose digestion is a substance called lactic acid (responsible for the sour taste in fermented dairy products). Besides having known inhibitory effects on harmful species of bacteria (21), lactic acid boosts the absorption of calcium, phosphorus and iron, and has been shown to make milk proteins more digestible by knocking them out of solution as fine curd particles (22)(23). Approximately two thirds of the fat in milk is saturated. Good or bad for you? Saturated fats play a number of key roles in our bodies: from construction of cell membranes and key hormones to providing energy storage and padding for delicate organs, to serving as a vehicle for important fat-soluble vitamins (see below) (24). All fats cause our stomach lining to secrete a hormone (cholecystokinin or CCK) which, aside from boosting production and secretion of digestive enzymes, let's us know we've eaten enough (25)(26). With that trigger removed, non-fat dairy products and other fat-free foods can potentially help contribute to over-eating. Now consider that prior to 1900, very few people died from heart disease. The introduction of hydrogenated cottonseed oil in 1911 (as trans-fat laden Crisco) (31)(32) helped begin the move away from healthy animal fats, and toward the slow, downward trend in cardiovascular health from which millions continue to suffer today. CLA, short for conjugated linoleic acid and abundant in milk from grass-fed cows, is a heavily studied, polyunsaturated Omega-6 fatty acid with promising health benefits (33). It certainly does wonders for rodents, judging by the hundreds of journal articles I've come across! (34) There's serious money behind CLA, so it's a sure bet there's something to it. See my Fat Primer for a better understanding of saturated fats and fatty acids and their impact on our health. Volumes have been written about the two groups of vitamins, water and fat soluble, and their contribution to health. Whole raw milk has them all, and they're completely available for your body to use. (37) Whether regulating your metabolism or helping the biochemical reactions that free energy from the food you eat, they're all present and ready to go to work for you. Just to repeat, nothing needs to be added to raw milk, especially that from grass-fed cows, to make it whole or better. No vitamins. No minerals. No enriching. It's a complete food. Our bodies, each with a biochemistry as unique as our fingerprints (38), are incredibly complex, so discussions of minerals, or any nutrients for that matter, must deal with ranges rather than specific amounts. Raw milk contains a broad selection of completely available minerals ranging from the familiar calcium and phosphorus on down to trace elements, the function of some, as yet, still rather unclear. An interesting feature of minerals as nutrients is the delicate balance they require with other minerals to function properly. For instance, calcium needs a proper ratio of two other macronutrients, phosphorus and magnesium, to be properly utilized by our bodies. Guess what? Nature codes for the entire array of minerals in raw milk (from cows on properly maintained pasture) to be in proper balance to one another (43) thus optimizing their benefit to us. The 60 plus (known) fully intact and functional enzymes in raw milk (44)(45) have an amazing array of tasks to perform, each one of them essential in facilitating one key reaction or another. Some of them are native to milk, and others come from beneficial bacteria growing in the milk. Just keeping track of them would require a post-doctoral degree! To me, the most significant health benefit derived from food enzymes is the burden they take off our body. When we eat a food that contains enzymes devoted to its own digestion, it's that much less work for our pancreas. (46) Given the choice, I'll bet that busy organ would rather occupy itself with making metabolic enzymes and insulin, letting food digest itself. The amylase (47), bacterially-produced lactase (48), lipases (49) and phosphatases (50) in raw milk, break down starch, lactose (milk sugar), fat (triglycerides) and phosphate compounds respectively, making milk more digestible and freeing up key minerals. Other enzymes, like catalase, (51) lysozyme (52) and lactoperoxidase (53) help to protect milk from unwanted bacterial infection, making it safer for us to drink. Milk contains about 3mg of cholesterol per gram (54) - a decent amount. Our bodies make most of what we need, that amount fluctuating by what we get from our food. (55) Eat more, make less. Either way, we need it. Why not let raw milk be one source? Cholesterol is a protective/repair substance. A waxy plant steroid (often lumped in with the fats), our body uses it as a form of water-proofing, and as a building block for a number of key hormones. It's natural, normal and essential to find it in our brain, liver, nerves, blood, bile, indeed, every cell membrane. (56) The best analogy I've heard regarding cholesterol's supposed causative effects on the clogging of our arteries is that blaming it is like blaming crime on the police because they're always at the scene. Seriously consider educating yourself fully on this critical food issue. It could, quite literally, save your life. See my Cholesterol Primer to learn the truth. With high levels of lactic acid, numerous enzymes and increased vitamin content, 'soured' or fermented dairy products like yogurt and kefir (made with bacteria and yeast, actually) provide a plethora of health benefits for the savvy people who eat them. (58) Being acid lovers, these helpful little critters make it safely through the stomach's acid environment to reach the intestines where they really begin to work their magic (59) (Above right, Lactobacillus casei). Raw milk is a living food with remarkable self-protective properties, but here's the kick: most foods tend to go south as they age, raw milk just keeps getting better. Not to keep harping on this, but what the heck: through helpful bacterial fermentation, you can expect an increase in enzymes, vitamins, mineral availability and overall digestibility. Not bad for old age! Use common sense and stick with whole, unprocessed foods, free from genetic tweaking (there's still just too much conflicting information out there on that topic), and you'll likely be ahead of the game. Cook your foods minimally, and you'll be even better off. Learn about sprouting and fermentation. Question everything before letting it past your lips. Explore what worked for countless generations before ours, and put it to work for yourself today. You can achieve great health by diet alone. I've done it, and so can you! (4) Crewe, J., 1929. 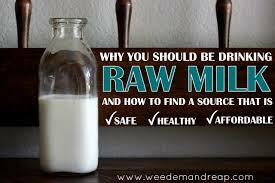 Raw milk cures many diseases. Certified Milk Magazine, January:3-6. (7) Mattick, E., Golding, J., 1936. Relative value of raw and heated milk in nutrition. Lancet 2:703-6. (35) Dhiman, T. R., et al, 1999. Conjugated linoleic acid content of milk from cows fed different diets. J Dairy Sci 82:2146-56. (38) Biochemical Individuality, Keats Publishing, 1998. Williams, R. J. Soured raw milk is fabulously healthy by itself! so don't throw away your soured raw milk. Look here for healthy recipes for your sour raw milk.